Today I joined Josh Rose for his sector of the Greenfield CBC. Our plot was centered around Turner's Falls covering sites entirely situated on the eastern side of the Connecticut River, roughly from the Turner's Falls Rod and Gun club south to the bike path off Greenfield Road. It's the only day of the year which gives me the opportunity to spend an entire day birding sites that typically I would only visit for an hour or less whenever I managed to get out locally. It felt like a true winter's day with four or five inches of fresh powdery snow on the ground, at times drifted by 15-20 mph northerly winds. Temperatures never rose above freezing all day and actually felt much colder due to the wind chill. Migratory Way - Turner's Falls power canal, early morning before the snow plough. December 30th, 2012. Bird-wise the day included a fine tally of 51 species beginning at 0650hrs with a calling Eastern Screech-owl at the Turner's Falls canal. This bird gave 'whinny' calls constantly for 20 minutes and was a personal highlight for me. Incredibly, Josh and I heard another giving 'whinny' calls at around 10am just north of Depot Street giving us two day-calling screech-owls for the count. We found Barrow's Goldeneyes from the bike path at Greenfield Road, at Barton Cove and the power canal, a Lesser Black-backed Gull off Unity Park, Pine Grosbeaks in downtown Turner's Falls, Ring-necked Ducks and Lesser Scaups at the Rod and Gull club, and the long staying Pied-billed Grebe on the power canal. As always, redpolls proved to be frustrating with a flock of over 30 buzzing around the power line cut north of Depot Street with only a single bird offering itself for definitive identification - that one was a Common Redpoll. All in all, a superb count well above expectation - amazing what can be discovered on the local patch in a single day with a bit of effort! American Robin at dawn - Turner's Falls, Franklin Co., MA. December 30th, 2012. Turner's Falls power canal - Josh Rose getting the count the underway,early morning, December 30th, 2012. Barrow's Goldeneye - female (right) with female Common Goldeneye, CT River at Montague City, Franklin Co., MA. December 30th, 2012. We believe that the same female Barrow's flew into the power canal at dusk along with almost 40 Common Goldeneyes. Barrow's Goldeneye - adult male, Barton Cove from Unity Park, Franklin Co., MA. December 30th, 2012. Lesser Black-backed Gull - adult (left) with American Herring and Ring-billed Gulls. Found at lunch time when it was the only dark mantled gull present for a while. Unity Park, Turner's Falls, Franklin Co., MA. December 30th, 2012. Pied-billed Grebe - Turner's Falls power canal, Franklin Co., MA. December 30th, 2012. Present since late October but capable of disappearing for long periods. Pine Grosbeak - one of three female-types, 3rd street, Turner's Falls, Franklin Co., MA. December 30th, 2012. The birds fed oblivious as a guy used a snow-blower to clear the sidewalk below their feeding tree! I still can't get used to how absurdly tame these northern breeders can be. Belted Kingfisher - male by the CT River, Montague City, Franklin Co., MA. Pileated Woodpecker - working cavities by the CT River, Montague City, Franklin Co., MA. December 30th, 2012. With an hour to myself just before lunch, I decided to head to Bennet Meadow WMA, Northfield in pursuit of some Redpolls seen by Mark Taylor on Christmas Eve. The site is on the western bank of the Connecticut River, a mere 10 minutes drive north of our house in Gill and only just outside the Gill town line. As soon as I arrived I noticed goldeneyes on the river knowing all too well that they'd provide a major distraction from my redpoll quest. I spent the next 45 minutes with the goldeneyes and never made a serious effort for the redpolls though they appeared to be missing today. The concentration of goldeneyes proved to be one of the best I've seen on the Connecticut with at least 85 Common Goldeneyes present in a loose group. Among them, a nice female Barrow's Goldeneye, the first I've seen locally for a while and certainly my first within this winter period. The birds were distant and the photos poor, but I really enjoyed watching them and listening to the whirring of wings as they flew past. Barrow's Goldeneye - female (right), Connecticut River at Bennet Meadow, Northfield, Franklin Co., MA. Female goldeneye with largely orange-yellow bill, steep forehead, and bulky 'mane'. Very dark-brown head contrasting with whitish-gray breast. Common Goldeneyes - Connecticut River at Bennet Meadow, Northfield, Franklin Co., MA. About 55 of the 85 birds present captured in this image. Barrow's Goldeneye - female (second from right), Connecticut River at Bennet Meadow, Northfield, Franklin Co., MA. Female goldeneye with largely orange-yellow bill, steep forehead, and bulky 'mane'. Compare head shape with the surrounding female Common Goldeneyes. Barrow's Goldeneye - female (extreme right), Connecticut River at Bennet Meadow, Northfield, Franklin Co., MA. Another record shot providing comparison with Common Goldeneyes. We've just returned from a short family break to Outer Cape Cod over the early part of the Christmas period. Christmas Day was pretty miserable weather-wise with freezing drizzle for much of the day, but I was fortunate to get out to Race Point (Provincetown) and enjoy an hour of seawatching before the really poor weather moved in. For the first 45 minutes the sea was flat calm providing ideal conditions to scan for loons. When it was finally light enough to see well, I found numerous Common and Red-throated Loons in the calm conditions and then, at 07:25hrs, a nice adult Pacific Loon. The latter species is still on the state review list and one that I've encountered on only a handful of occasions in Massachusetts. Other species of interest included large numbers of Razorbills, plus three Common Murres and a Black Guillemot. These were the only alcids I could find despite much scanning for Dovekies - weather conditions just not right for them I guess. Some five Red-necked Grebes were present along with many tens of Red-breasted Mergansers and Common Eiders. All three scoters were seen though not in large numbers. Most of the gulls I saw were flying east, possibly heading for a Pilot Whale carcass farther down the beach that we'd found the previous day - 1 adult Glaucous, 4 Kumlien's Gulls and about 6 Black-legged Kittiwakes were the most notable gulls amongst rather small numbers of the three common species. Aside from 55 Dunlins and 35 Sanderlings I had the beach to myself for an hour until the first dog walkers arrived. Pacific Loon - Race Point, Provincetown, MA. December 25th, 2012. Yep...horrendous and probably unidentifiable image of a Pacific Loon about 400m offshore. Digi-scoping has its limits and in completely overcast skies with drizzle, shortly after first light, this just didn't work. Below are my sketches of the bird drawn from memory shortly after the observation, and before consulting any references. Kumlien's Iceland Gull - Race Point, Provincetown, MA. December 24th, 2012. Second-cycle bird heading west and likely one of two second-cycle birds seen heading east on the 25th. Common Murre - Race Point, Provincetown, MA. December 25th, 2012. Just ten meters from shore, losely associating with a flock of Red-breasted Mergansers. Two more distant birds were foraging off shore though never with the numerous flocks of Razorbills present. Pilot Whale? - Race Point beach, Provincetown, MA. December 24th, 2012. Presumed Pilot Whale carcass being examined by Susannah and Matan. Probably no more than 9 feet in length and completely black in color. Curiously, the tail was completely missing and appeared to have been 'sheared' off. Several gulls were feeding on this, most of which were Great Black-back Gulls. Northern Lapwing - Bridgewater, Plymouth Co., MA. December 2012. Long staying and much watched individual favoring the same arable fields off Summer Street for about six weeks. A good excuse for another family 'twitch' and much more satisfactory views than the two birds I saw on Nantucket in early November. We found this bird feeding actively but it was also quite flighty, and was heard calling once. Not too many changes amongst the regular feeder birds at our home in Gill over the week. We have a consistent flock of Dark-eyed Juncos (c.20) and American Tree Sparrows (c.25) visiting most days, pretty much throughout the day. White-throated and Song Sparrows have been present too, but only in singles. The nyjer seed feeders have been well used by American Goldfinches and Black-capped Chickadees all week, and two House Finches visited in mid-week. Redpolls remain absent, clearly not tempted by our feeders at this stage in the winter - hopefully they'll show up at some point. 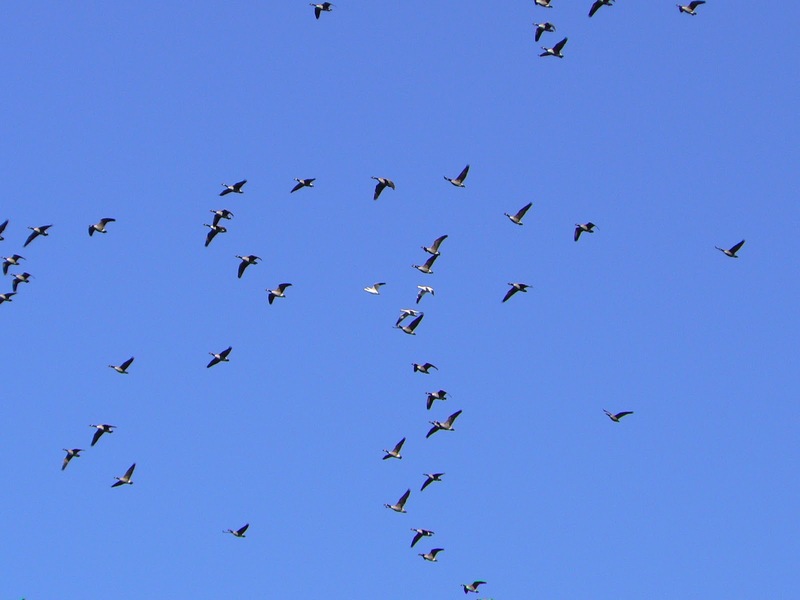 Daily flights of up to 1000 Canada Geese continue to commute to between Turner's Falls and feeding areas in Gill and Bernardston. Last Saturday, three Snow Geese joined them, birds which later turned up on the Turner's Falls power canal. 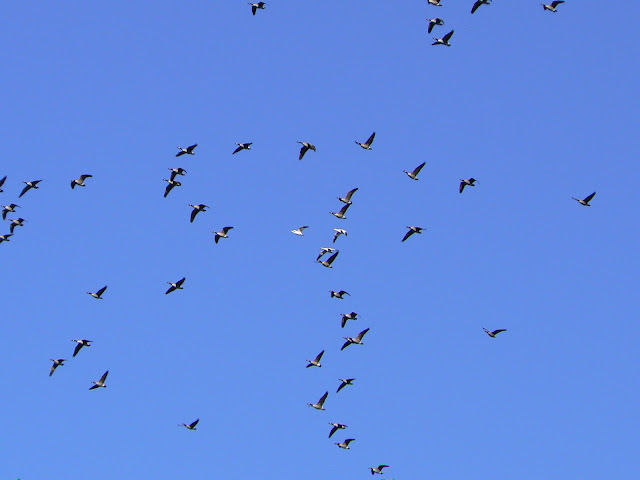 This was our third observation of Snow Geese over the house, all of them being within the late October-December period. Snow Geese (center)- with Canada Goose flock,Gill, Franklin Co., MA. December 15th, 2012. This morning was so crisp and beautiful that I couldn't face spending it indoors. I headed back down to the Hadley Honey Pot, scene of our sector in last Sunday's Northampton CBC. My goal was to find redpolls and then spend some time with them. Perhaps I was a little arrogant in this thought process because finding a group of co-operative redpolls proved to be a much more difficult task than I imagined......but, ultimately, I found a nice flock of about 35 birds and had them feeding as close to me as three feet. Among them, Commons, Hoaries and a couple of birds that I wasn't comfortable calling either way. For the most part, these undetermined birds also looked like Hoaries to me. The image set below features a selection of these birds, but for the time being I've avoided adding captions to them. Each image is numbered, so please feel free to have a go at identifying them yourself! All the images are digi-scoped and were taken with a Panasonic Lumix FZ7 on the morning of December 20th, 2012 in the Hadley Honey Pot, Hampshire Co., MA. 1) redpolls - Hadley Honey Pot,Hampshire Co., MA. December 20th, 2012. 2) redpoll - Hadley Honey Pot,Hampshire Co., MA. December 20th, 2012. 3) redpoll - Hadley Honey Pot,Hampshire Co., MA. December 20th, 2012. 4) redpoll - Hadley Honey Pot,Hampshire Co., MA. December 20th, 2012. Same bird as in shot 3. 5) redpoll - Hadley Honey Pot,Hampshire Co., MA. December 20th, 2012. 6) redpoll - Hadley Honey Pot,Hampshire Co., MA. December 20th, 2012. Same bird as image #5. 7) redpoll - Hadley Honey Pot,Hampshire Co., MA. December 20th, 2012. 8) redpolls - Hadley Honey Pot,Hampshire Co., MA. December 20th, 2012. 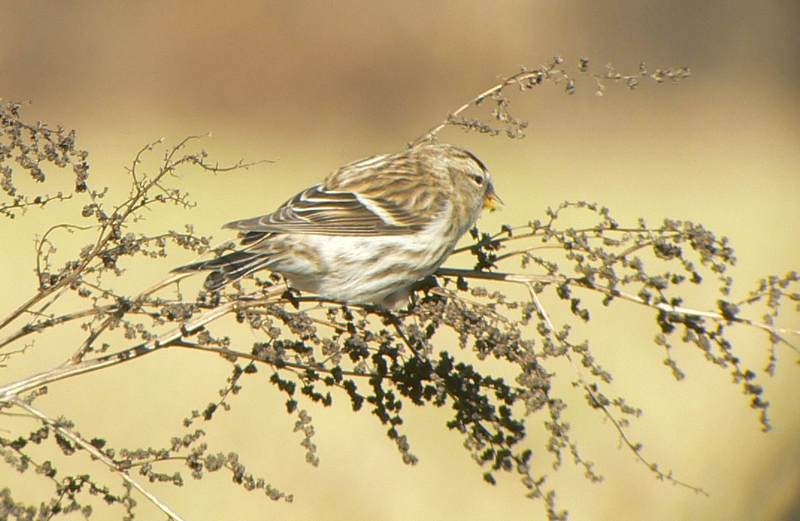 ﻿9) redpolls - Hadley Honey Pot,Hampshire Co., MA. December 20th, 2012. ﻿10) redpoll - Hadley Honey Pot,Hampshire Co., MA. December 20th, 2012. Same bird as in images #3 and #4. ﻿11) redpoll - Hadley Honey Pot,Hampshire Co., MA. December 20th, 2012. ﻿12) redpolls - Hadley Honey Pot,Hampshire Co., MA. December 20th, 2012. ﻿13) redpolls - Hadley Honey Pot,Hampshire Co., MA. December 20th, 2012. ﻿14) redpolls - Hadley Honey Pot,Hampshire Co., MA. December 20th, 2012. ﻿15) redpolls - Hadley Honey Pot,Hampshire Co., MA. December 20th, 2012. ﻿16) redpolls - Hadley Honey Pot,Hampshire Co., MA. December 20th, 2012. ﻿17) redpolls - Hadley Honey Pot,Hampshire Co., MA. December 20th, 2012. ﻿18) redpolls - Hadley Honey Pot,Hampshire Co., MA. December 20th, 2012. Same birds as images #16 and #17. 19) redpoll - Hadley Honey Pot,Hampshire Co., MA. December 20th, 2012. 20) redpoll - Hadley Honey Pot,Hampshire Co., MA. December 20th, 2012. 21) redpoll - Hadley Honey Pot,Hampshire Co., MA. December 20th, 2012. Same bird as images #19 and #20.